TUSCALOOSA, Ala. (AP) — Jerry Jeudy took a slant pass 34 yards on Alabama’s first drive against Louisiana-Lafayette to set up a touchdown and Henry Ruggs III capped the Crimson Tide’s second offensive possession with a 13-yard score. Then freshman Jaylen Waddle returned a punt for another TD. Seven minutes, three Alabama receivers, three big plays on offense or special teams. That game-opening sequence illustrates just how talented and deep the top-ranked Crimson Tide is at wide receiver, and it doesn’t even include DeVonta Smith. And quarterback Tua Tagovailoa is finding all of them with regularity, producing some highlight-reel catches and shifty or tackle-breaking runs. Tagovailoa’s emergence is undoubtedly the single biggest factor in Alabama’s offensive explosion , but the four wide receivers — plus tight end Irv Smith Jr. — have taken turns producing big games and catches. That hasn’t changed all that much whether it’s Tagovailoa or backup Jalen Hurts throwing the passes, either. A program that over the past decade has produced a one-at-a-time assembly line of standout receivers — from Julio Jones to Amari Cooper to Calvin Ridley — now has found a way to mass produce them. The result: A Tide offense normally known more for its tailbacks and running game now leads the nation in scoring and ranks 10th in passing heading into Alabama’s road game Saturday at Arkansas. Sophomores Jeudy, Ruggs and Smith arrived in the same recruiting class as Tagovailoa and each had flashes last season. But all three have already topped their catch and yardage totals from last season. Jeudy is the leader of the pack with 19 catches for 423 yards and six touchdowns. He’s fourth in the SEC in receiving yards per game and Ruggs is seventh. Smith isn’t far behind, and Waddle’s 24-yard average per catch leads the team. — Jeudy was a five-star recruit from south Florida, like Cooper and Ridley before him. He’s averaging 22.3 yards per catch for the Tide. 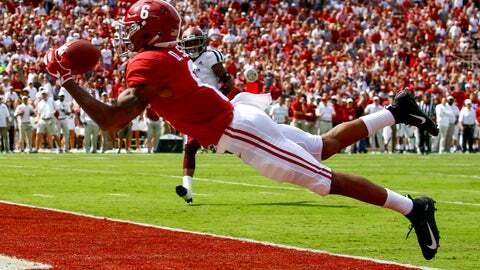 His best game: three catches, 136 yards, two touchdowns — including a 79-yarder — against Mississippi. —Ruggs has 296 yards and five touchdowns after scoring on half of his 12 catches last season. He bounced off a couple of Louisiana defenders downfield on his way to a 54-yard TD from Hurts. Best game: five catches, 116 yards, two TDs against Louisville. —Smith is best known for catching the walk-off touchdown pass in overtime to win the national championship game. He’s got 269 yards on 15 catches this season, including a diving TD grab against Texas A&M. Best game: four catches, 99 yards in opener against Louisville. —The youngster of the group, Waddle has 264 yards on his 11 catches, including a 94-yarder from third-teamer Mac Jones last weekend. Leads the SEC with a 19.9-yard average on punt returns. Best game: 138 yards and two touchdowns against Louisiana plus the punt return score. But these receivers are a package deal right now.